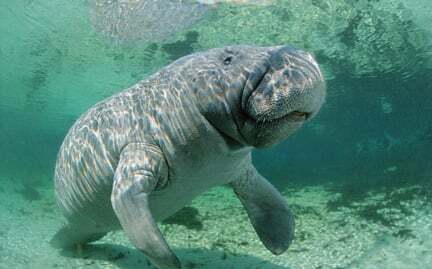 West Indian manatees inhabit rivers, canals, estuaries and bays from Florida through the Caribbean, along the eastern coast of Central America and the northern coast of South America. Feeding on sea grasses, freshwater plants, and floating vegetation, manatees eat for six to eight hours a day, consuming 11 percent of their body weight. While these creatures are surprisingly agile, collisions with boats, as well as pollution, pose serious risks to manatees.